Many times, having a conversation with an eCommerce professional leaves you scrambling for a dictionary! Don’t worry, you aren’t alone! Businesses new to eCommerce, whether you are a seller, buyer or enabler, should be well-versed in the eCommerce jargon that gets passed around in everyday discussions. Below is a list of the most popular keywords, buzzwords, and phrases used in the eCommerce industry. This post is a slight different post than the others as it will talk about the different eCommerce terms that are used in today’s time. It is highly important to get acquainted to them to better understand the online world. This refers to as permanent redirection from one URL to another so as to send site visitors and search engines to the new URL than the one they originally typed automatically. 301 Redirect is a key practice in order to maintain the website’s domain authority and search rankings when URL of the site is changed for any reason. The Status code of 301 in turn means that the page has been permanently moved to a new location. In eCommerce, this term means a visitor has visited the website and have left the webpage without making a desired action. It is a situation wherein a buyer has placed items in his shopping cart but leaves without purchasing them due to any reason. It is also called as cart abandonment. There are many other types of abandonment like booking abandonment, shipping abandonment etc. but in tech world, shopping cart abandonment is widely used. A/B Testing is a method used by website development companies to compare two web pages to determine which one performs better. There are two variants of the web page which are shown randomly to the prospect and the page which provides a good conversion rate is opted. Thus this mechanism helps to figure out the best online promotional and marketing strategies for online business. A/B Testing is also called as Split Testing and can be used on popups and emails too. Example – Humana’s banner testing example clearly reveals the effectiveness of A/B testing in increasing the clickthroughs. 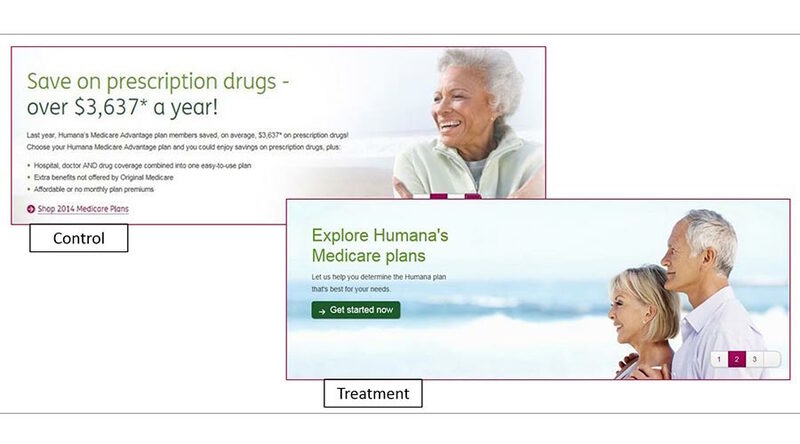 The above image shows two banners displayed on Humana’s homepage which underwent A/B testing. The 1st banner looked cluttered with ample of copy & paragraphs and less noticeable CTA button. Whereas the 2nd banner had a clear indication of the purpose with a strong CTA to support it. The result of the testing showed 433% increase in clickthroughs for 2nd banner variation that had clean design and up to the point copy. After making a little more variations in the microcopy on the CTA button, it helped them achieve an increase in the clicks by further 192%. A process that every credit card company implements in their system which allows them to verify whether the billing address of the credit card provided by the user matches the address provided on the credit card statement. It can be matched to the address which the credit card company has in their record or on the credit card statement. An affiliate is a type of inter-company relationship where one firm sells other merchants’ products on his own website. An affiliate can be termed as a commercial partner of the merchant who promotes the merchant’s products and services on his website by means of different visual tools. In return an affiliate is paid commission by the merchant if the customer comes to his website and makes a purchase of the merchant’s goods. An affiliate is determined by the degree of ownership a parent company holds in another company. This is a marketing arrangement in which a business pays commission to one or more affiliates for each conversion achieved due to affiliate’s marketing efforts. In simple words, when an external website refers a customer to your online site and makes a purchase, the external website receives a commission for directing traffic to your site for sales. Affiliate marketing is a type of performance-based marketing. Example – The Affiliate program of Tyche Softwares provides details on the commission associated in becoming an affiliate for them along with other terms and conditions. To know more Click Here. An API is a set of protocols, specifications or instructions allowing two software applications to interact and exchange data. It is used for developing software applications where it acts as an interface between different software programs and allows interaction. It helps developers to use these standard commands to perform operations so that they do not have to write the code from scratch. Additionally, APIs are used when programming graphical user interface (GUI) components. This is a process of granting permission to someone to allow them to give orders or make decisions or take an action. Example – In multi-user systems, there is a right given to system administrator to define roles for different users which gives them access to the system and privileges for the use of certain file directories or system data. This is called as giving authority to the users to perform an action. Thus, authorization is seen as both; the setting up of permissions by a system administrator and the actual checking of the permission values that have been set up when a user is getting access. Average Time on Site is mostly seen in web analytics report which refers to the amount of time the visitor has spent on the webpage they visited while browsing. This is the time measured in minutes or seconds and can be misleading in the analytics report sometimes, because it does not calculate the actual reading time of the visitor on the webpage. The accurate time on the webpage cannot be estimated as there could be instances when the visitor may be interacting with the pages and site content or they could have left the browser window open and were not actually viewing the webpage. Example – If Average Time on Site is calculated as 10 seconds for a long blog post, then it is assumed, that visitors are not reading the post unless in a rare case you have an extremely fast reader reading it. In eCommerce, B2B is referred to as exchange of products and services between two businesses. It is a situation where one business commercially transacts with the other business. It could be a manufacturer with wholesaler, or a wholesaler with a retailer. B2B decision making may take place at more than one level. For instance, when a salesperson meets with the departmental manager to bring about sale, the departmental manager has to get approval from the business owner before the proposed sale is closed. In contrast to B2B, Business to Consumer (B2C) refers to a business or transaction that is conducted directly between a company and consumers who are the end-users of its products or services. Websites that offer consumer products are B2C. Example – A mother is looking for educational toys. She finds the website, reviews the product and buys the toy. Thus this business model refers business as a website, consumer as the mother and product as a toy. Amazon, Flipkart, eBay etc are some of the best suited B2C examples. The term B2C became immensely popular during the dotcom boom in the late 1990s. During that time, businesses were referred as online retailers, or companies that sold products and services to consumers through the internet. A blog is nothing but an informal conversational style of information or a discussion which is updated regularly on a website or a webpage and is run by an individual or a small group. The word blog was derived from the combination of the word Web and Log. Individuals or small groups concentrate on specific topics and focus on detailing the subject in an informal diary-style text entries. Blogs often has images and links to other websites and it also provides forums for discussions. Some use these as a platform to jot down their personal journey or diary. Bounce Rate is expressed in percentage and refers to the percentage of visitors who navigate away from the website without visiting other pages of the site. This term is specially used in web traffic analysis as it measures the effectiveness of a website in encouraging users to move ahead in their journey on the website. Example – Let us look at how Google Analytics calculates Bounce Rate. This shows that Bounce Rate is calculated specifically upon session triggers. A bounce is called a single-page session which implies that only a single request has been sent to the Analytics server. This is because a user opens one page on the site and exits without triggering any other request to the server in the same session. 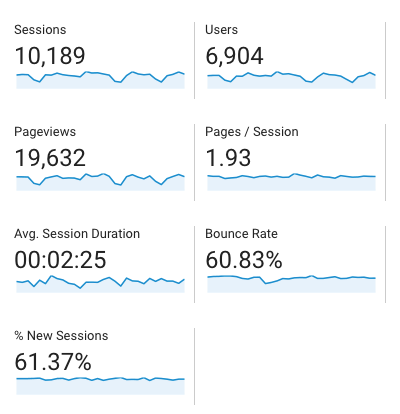 Bounce Rate as per Google Analytics is calculated as a percentage of all sessions in which users visited only a single page without sending any other request to the Analytics server. Length of such single-page sessions is for 0 seconds duration as the Analytics is unable to track the session as no other hits are made after the first one. Bottom of the Funnel is referred to as a Transaction phase or Purchase stage of the online buying process. At this stage the visitor has done all the research and is about to make a purchase, thus leading ahead to become a ‘New Customer’. Bottom of the Funnel if preceded by the ‘Top of the Funnel‘ which means product/service comparison stage and the ‘Middle of the Funnel‘ which means validation stage. As you move from traditional retail, this is going to be your new identity. A brick-and-click store any business with at least one physical location and an eCommerce-enabled website. This is an upgrade to the brick-and-mortar we are so familiar with. As a business, you should consider this model and it gives the best customer-experience, where they can enjoy the convenience of shopping online with the security and the human touch of visiting a store. You can capitalize on having your customer’s attention in both the real and the virtual world. It is a marketing strategy wherein several similar products or services are combined together and sold as one package solution. Businesses often sell these bundled products at a reduced price so as to attract more customers. This concept has proved to be very convenient when more than one product or services have to be purchased from one company. These products or services which are sold as a single combined unit could consist of dissimilar products that appeal to a group of customers. This is a powerful marketing and communications tool which helps your business to get more visibility online. It’s primary use is for public relations purposes where you post about subject matters which are related to your business. For instance, HubSpot is an inbound marketing platform, so their blogs talk on subjects related to inbound marketing. Business blogging implies writing a Business Blog which is also referred to as a Corporate Blog. These are basically published in order to achieve company’s organizational goals. This marketing tactic helps companies to communicate better with stakeholders of all types, from customers to suppliers and from partners to employees. It is a metric that allows you to determine unique purchases per number of views of product details page. Buy-to-Detail Rate helps you to understand what products users are purchasing after browsing through the product details. Thus you can identify the products on your list that makes the most sales and the ones who do not contribute to it. Buy-to-Detail Rate = Total Unique Purchases of a product / Product Detail Page views. Buyers Persona is a semi-fictional representation of your prospective customer based on market research and real data of your existing customers. While preparing a buyers persona its important to consider their journey, behavioral pattern, demographics, goals etc. a. Who are the buyers and their goals? b. How they think and what drives their behavior? c. On what terms are they making buying decisions? These are words or phrases incorporated in a message or sales script that induces a viewer, reader or listener to take immediate action. Typical CTAs used in marketing and advertising are ‘Buy Now‘, ‘Call Now‘, ‘Click Here‘ etc. Such words prompts an immediate response or encourage visitors to make a purchase. CTAs have greatly proved its impact on the conversion rates. Effective use of CTAs in different transitions can also be fruitful. For instance, the slide-in CTA on OfficeVibe website which is shown in the below image, brings out an engaging element with its copy alongwith a prominent CTA button that makes you click it. This CTA message crops up from bottom of the page when you are going through the blogs on the site. The transition in which it appears on the screen was the best part of their design. And to top it all, it displayed what you were seeking for, thus persuades the user to click on it. This refers to a ratio of the number of shopping carts in total versus the number of completed transactions. It is basically the rate at which visitors initiates the purchase by adding an item to their cart and leaves the site without completing the transaction. This statistics can help online shop owners to keep a track of abandoned carts and figure out whether it is a profitable eCommerce business or unsuccessful. 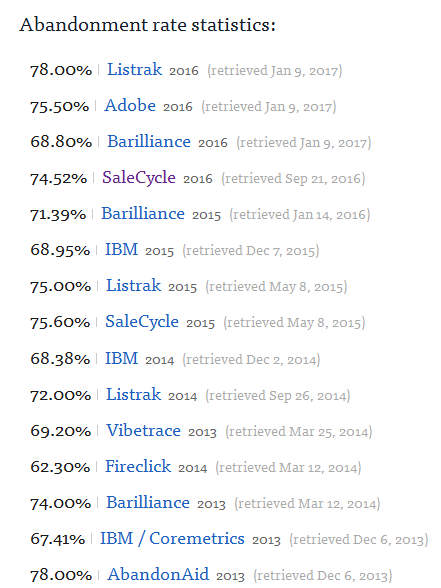 It is interesting to have the statistics of Cart Abandonment Rate of last few years to understand if there was an increase or dip in the abandonment rate. Below image displays the stats from 2013 till date. For more details, Click Here to visit the source. Designed to protect cardholders from fraud, chargeback is the reversal of funds to a customer. When does this happen? When customers feel they have been sold a sub-par product, if the transaction is fraudulent or if they raise any other, valid, concern regarding the product. As an online store, chances are that a large part of your payments will come through credit cards. So you can take steps to safeguard against chargebacks being misused against your business, as chargebacks are going to be (whether you like it or not) a problem with your payment processing provider. It is the percentage of customers or subscribers who cut ties with the company or from the services in the given period of time. So it is basically the revenue or customers lost during a specific period (typically a month), by unsubscribing from the services. Churn Rate is also called Attrition Rate. Closed loop marketing is an effective method used by companies for analytics purpose and to achieve better insights into marketing campaigns that lead to ROI. This method involves collection of customer data from multiple channels, analyzing this data and using the information to create appropriate content for targeted groups of customers. This data involves information from marketing campaigns including your website, content offers, blogs, SEO tactics, emails etc. It is a data driven approach connecting end results of every campaign to the marketing initiative which in turn helps to understand its effectiveness. It is an analysis of customer behavior who are separated into groups of people with same attributes. It involves examining how specific characteristics of a cohort (group) changes over time. Cohort Analysis is one of the most powerful tools for marketers that helps them to assess long-term trends in customer relation. Basically it is a process of identifying relation between cohort’s attributes and their behavior. A CSV or a comma-separated file is a file-type that stores data in a tabular form. They look like a general spreadsheet but have a .csv extension. These files are extremely important to export or import large amounts of data, which, in the case of your online store, could be information regarding customers, products, inventory and more. The CSV file format makes it easy to export, import and convert, and can be used to co-ordinate among different arms of your business. For instance, receiving data from the manufacturing unit to send to the finance division of your company. A term Conversion, in simple words is a point when an anonymous website visitor converts to a customer after making a purchase. Thus the result of the response to a Call-To-Action is called conversion. A conversion happens when a visitor clicks the ad and performs an action desirable to the company. This means getting your visitors to do what you want them to do like buy a product, sign up for a newsletter, register for a webinar or fill out a lead/contact form. Thus conversions help you understand how much value your marketing strategy brings to your business. This term is used in eCommerce to describe the series of events that occur during the customer’s journey of buying goods online. It is a journey right from initiating the purchase to the navigation process and ultimately to converting into a sale. But it is called a funnel as at every stage the number of visitors drops and at the final stage where purchase happens, there is a decreased number compared to the start of the buying process. Conversion Path is a step-wise approach that involves converting anonymous website visitor into a known lead. The typical conversion path begins when a user arrives on the landing page, browses through series of page transitions and reaches the final state which is either a purchase or an abandoned session. These are steps taken by the user to achieve his desired goal starting either from any remarkable offer or Call-To-Action buttons. Thus it is a series of website based events undertaken by the visitor that might convert into a potential lead. Conversion Rate is a marketing concept measured in percentage. It is a rate at which visitors convert on a site, which means dividing the number of people who transformed into paying customers by the number of visitors that visited the site. In simple words, its the percentage of visitors who take a desired action. This desired action of the visitor is achieved only through site usability which includes intuitive navigation and fast loading pages. Example – Consider any eCommerce website is visited by 100,000 people on an average in a month. During that month, 2,000 users purchased something from the site, then the site’s conversion rate is 2,000/100,000 = 2%. This is a process of enhancing the user experience of a website to improve the chances of convincing the visitors to complete their online goal. This involves tweaking the web layout, content and design as a whole so that the goal for hiking the conversion rate is achieved. The process involves clear understanding of web design basics, human psychology, and statistics. Example – Below is an excellent example that shows eCommerce Conversion Rate Optimisation success. There was an increase of 34% in Add-To-Cart rate by making variations in the product navigation as shown in the above image. The main goal of the online retailer was to drive maximum traffic from parent categories to sub categories. They first studied the reason why visitors were not engaged to the menu options of both categories placed on the top of the page and also why the right side area was not liked and clicked by the visitors (Left side design of the above image). Considering the outcome of the analysis, they decided to change the navigation mode from top to left side menu bar as shown on the right side of the above image. This looked more organised and clean allowing space for bigger product thumbnails. These minor variations resulted in 8.9% increase in user engagement with the menu options and visitors could freely navigate to more category and subcategory pages. Thus hiking the sales for the website, thus proving CRO to be directly proportional to the increase in sales. CMS is a back-end solution developed to control the content of the website which is the front-end. This software application allows you to create, edit, maintain, publish, and display content on the Internet from a single administration tool. Thus this system has made it easy for administrators with no programming knowledge to create and manage digital content. Along side the web publishing tool that it provides allows one or more users to publish updates on the Web easily. CMS is basically used for Enterprise Content Management (ECM) and Web Content Management (WCM). There are many CMS systems available in the market out of which some to mention are WordPress, Drupal, Joomla, SilverStripe etc. To get detailed information on them Click Here. It is a holistic solution designed to help you manage your website and other components of digital marketing all together in one system. It provides you with sales-ready website that allows easy updates, have a responsive design for the website and give it a personalised look and feel. Thus it is a system that allows a content provider to use variety of techniques to improve search results and rankings. A cookie is a small amount of data generated by a website given to a web browser by a web server. This piece of information is stored on the client side on user’s own computer and is then used for future use. Main purpose of cookies is to remember information about you and records your preferences when using a particular website. This is a practice of selling additional services or products to the customers who has already made a purchase. It involves encouraging existing customers to buy related or complementary products while buying the selected items. This is a marketing tactic most widely used by online retailers. Example – A classic example for cross-selling is Amazon for its introduction of ‘Customers who bought this item also bought…’. Amazon’s sales showed a shooted value by 35% in 2006 which contributed solely from cross-selling. The idea behind showcasing similar products plays on your trust by bringing together people of same taste. This was done so gracefully that it did not seem like Amazon recommended the products thus building in the sense of acceptability in customers which in turn resulted in sales hike. Crowdsourcing is a practice of intellectual gathering of information that comes from loosely defined external group of people to achieve a business-related goal. This involves obtaining ideas, content, ideas or opinions from larger group of people who submit their data online via internet, social media and smartphone apps. Example – Traffic apps are made in such a manner that drivers are allowed to report accidents or traffic related information of certain areas so that real-time data can be provided to app users. There are 4 brands out of many others that provide clever Crowdsourcing campaigns like Doritos – Crash the super bowl, Starbucks – White cup contest, Lay’s – Do us a flavour, Airbnb – Shorts. To know in detail about these campaigns, Click Here. CRM refers to as a practice that helps an organisation to manage and analyze customer’s interactions throughout the customer life-cycle to improve customer relationship in order to achieve its business goal. This system integrates the back and front office systems to organise and document customer contacts, purchases, customer service and technical support provided in the process. It compiles information of customers across different channels like company’s website, telephone, live chat, direct mail, marketing materials and social media. Thus CRM serves to enhance the customer’s overall experience by providing enhanced customer service and products. Marketing 360, Pipedrive, Really Simple Systems etc are some of the best CRM softwares available in the market. You can Click Here to know the entire list of CRM softwares available with the ratings. CSS stands for Cascading Style Sheets, is a style sheet language used to format the presentation of a web page or document written in markup language. CSS helps to provide uniformity across several pages of the website by defining text styles, table sizes, and other aspects of Web elements. Thus this gives web developers and users more control on the layout of web pages. This metric is a prediction of the total value (Total net profit) an eCommerce company would make from the lifetime relationship with any given customer. Other marketing terms for CLV are Lifetime Customer Value (LCV), or Lifetime value (LTV). Online businesses can measure the profitability achieved from a customer depending upon this predicted monetary value generated from the entire relationship of the customer with your online store. CAC is an important business metrics which refers to the cost associated in acquiring and convincing potential customers. This helps to determine how to allocate resources while gaining new customers. It includes expenses related to product cost as well as research, marketing and incentives involved. The value of the customer to the company and Return On Investment of acquiring the customer can be calculated through this. Click Through Rate is a ratio that shows the number of clicks on a specific link or ad to the total number of visitors browsing through that page or ad. CTR is measured for a webpage, advertisements or links in emails which helps to determine the success of online marketing campaign. The CTR helps online retailers to understand the effectiveness of keywords and performance of the ads or email campaigns. Example – Considering an advertisement on the webpage which was incorporated with an idea of boosting online sales. In order to measure the success rate of this ad campaign, it was important to understand the CTR of that ad. This was done by calculating the number of clicks that this ad received divided by the number of times this ad was shown (Clicks/Impressions = CTR). So if there were 5 clicks on the ad and 1000 impressions, then CTR rate would be 0.5%. An eCommerce system today includes an overarching infrastructure which includes analytics from search engines, social platforms, mobile apps, and other corners of both the internet and the world of commerce. Together, this is called Digital Commerce. Knowing the vast extent of conducting business online also allows you to better prepare for marketing your business, helps you gather information about your customers’ purchase behaviors and cater to them accordingly. In eCommerce, a discount code is also called as a Coupon code or Promo code. These codes consist of letters and numbers which are computer-generated and used to activate discounts or special offers on the site. These are available via email or advertisements and are to be entered in the respective promotional box on the website (shopping cart or checkout page) to avail the discount. Example – A retailer might send promotional email to special customers offering them a 10% discount on using a discount code: WER56D while making a purchase on his site. So when the customer enters the code on the cart page before making the payment, he can avail a 10% discount on the whole order. This in turn is a vital marketing strategy to attract more traffic on the site. Discount rate is a percentage rate which is charged by the acquiring banks for processing the merchant’s transactions. This charge is a small percentage of each purchase and it depends on several factors like type of card, how credit card was processed and order placed, and whether CVM or AVS were used. Discount rate also refers to the Federal Reserve Bank’s interest rate that is charged to depository institutions that take loans from the Fed’s discount window. Dropshipping is a type of eCommerce arrangement where the goods are directly shipped from the manufacturer to the retailer or customer. This retail fulfillment method deals in direct delivery of goods without having to store or stock them. 1. There are merchants who have tie ups with manufacturers and they make an arrangement in such a way that they do not store or own an inventory. Instead the merchant purchases the goods as needed from the third-party (manufacturer or wholesaler) to fulfill order requirements. 2. There are merchants who partner themselves with suppliers or manufacturers and gives the shipping address to them so that they can ship the product directly to the customer upon request. Such a fulfillment strategy opted by shop owners saves them from tracking inventory and incur loss if the items did not make complete sale. Domain name is a unique name which is a part of the network address that locates an organisation or other entity on the Internet. You can find a domain name on the address bar of the web browser while visiting the website. Domain names are formed by rules and procedures of the Domain Name System (DNS) which is a naming system that provides addresses to web servers and web pages. Therefore a typical domain name of a commercial business say Amazon or Flipkart will be www.amazon.com and www.flipkart.com respectively. It is an online auction service provided by a multi-national eCommerce corporation that facilitates buying and selling processes. The company uses an electronic platform to allow consumers and businesses to buy and sell wide range of goods and services worldwide. On eBay website, sellers pay a fee for listing their products and a percentage of the sale of the item on eBay with an option to either Buy the product or Auction it. Payments on the site are usually made through PayPal or other payment options and then the merchandise is shipped to the buyer. An eBook also called as electronic book is a digital version of a printed book which can be read on a computer or a dedicated e-reader devices. It consists of text and images both in readable format and can be easily accessible on computer device that features a controllable viewing screen or on a specifically designed handheld device. eBook allows instant access to a book by simply downloading it over the Internet. An eBook can be published in different file formats like plain text, PDF, Rich Text Format, or image files. This publishing process helps anyone who publishes information to any platform like print, online, video, etc to keep content marketing organized and on schedule. Thus you can plan future issues and keep hold on prospective assignments. Email is short for ‘electronic mail’ and is referred to as a method of exchanging digital messages to a specified individual or group of individuals using digital devices such as computers, tablets and mobile phones. An email may contain text, files, images, or other attachments sent through a communication network that requires an email address which is unique to the user. The first email was sent by Ray Tomlinson in 1971 and 1997 marked the substantial use of email. These messages are usually encoded in ASCII text. Engagement Rate is a metric that is used to measure how much a visitor gets engaged to the given piece of content or ad. It shows a percentage of the people who came to the site, noticed the ad or content and could engage with it. Factors that influence the engagement of the visitor to a specific piece of content are users’ comments, likes and their shares. This helps to gauge user’s interest and willingness to know more on the specific bit that is displayed. Below example will help you understand how to calculate Engagement Rate for a Facebook post. On a facebook post there are 3 main interactive elements namely reactions, comments and shares. Considering this, the formula derived to calculate the Engagement Rate of a facebook post is ‘The total number of Reactions, Comments and Shares for a particular period to the total reach derived for the posts for the same period multiplied by 100. Let’s take some figures to understand this formula better. Refer the below image for the same. The above example shows that there were 2 posts made on a given day which achieved 1,120 interactions in total combining the reactions, comments and shares. There was reach of 25000 on the same given day which means these many users visited the posts. Therefore the average Facebook Post Engagement Rate would be 4.48 %. To know more Click Here. Evergreen content is a content that is timeless, sustainable and stays relevant and useful for months and years to come. It is referred to as SEO content that remains fresh for readers and is currently a buzzword in content strategy. This type of content is a must in today’s time especially to get appearance on search engines and drive more traffic onto the site. It has proved as a key success factor for content providers. Examples of evergreen content include how-to guides, personal stories, posts about company views that won’t change, a list of resources etc. Event-triggered-email is an automated email message which is sent to the list of subscribers when a particular event occurs. The events are determined from the information the subscriber has entered while registering on the site. For instance, a special message or discount coupon is sent to a subscriber on their birthday or anniversary date which was provided by them at the time of registering. Triggered based emails have proved to be advantageous in email marketing as it makes the customer feel valued and helps in retaining them. There are a few examples of Event-triggered-email and can be viewed Here. In eCommerce terminology, fulfillment is also called as Order fulfillment and referred to as a sequence of steps a company undertakes to process the order from the point of sale to the delivery of goods with customer satisfaction. Once the business has picked up and you are getting tons of orders, it is vital to have a fulfillment and distribution process in place. There are many SMEs or ecommerce businesses who outsource this process to companies specialised in fulfillment. It is a free web analytic service provided by Google that allows you to link up your website for tracking web traffic and provides statistics that is useful for SEO and marketing purposes. 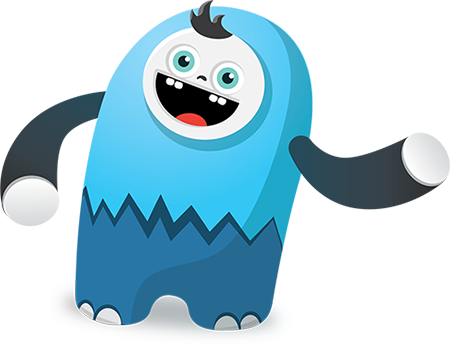 It is a freemium web analytic service which was launched by google in November 2005 after acquiring Urchin. Google Analytics is now the most widely used web analytics service on the Internet as it provides invaluable insights about your website that can be used for identify growth hacks. It is a marketing concept that involves rapid experimentation including analytical thinking and use of social metrics to identify the most effective way to grow business and gain exposure. This term was originally coined by Sean Ellis who himself was a growth hacker and a startup extraordinaire. It is process where hackers find the right trick that allows accelerated and accumulative growth. Here Growth hackers are marketers, engineers and product managers whose objective is to grow the number of users for a specific product by specifically focussing on building and engaging the user base of a business. Best example for this is Facebook. In its early stages they had built a cross-functional growth team which was led by a growth hacker where they were responsible for making Facebook available in every language through crowdsourcing, implementing a robust system for importing email contacts etc. This process gave them a huge boost. To know more, Click Here. It is a label or a phrase preceded by a hash character (#) used in social networks and microblogging services to identify the messages of specific topics. When customers use hashtags, the message that has been tagged to it is revealed. A hashtag archive is consequently collected into a single stream under the same hashtag. For example, on the photo-sharing service Instagram, the hashtag #bluesky allows users to find all the posts that have been tagged using that hashtag #bluesky. Hashtags are widely used in Twitter, Instagram, Pinterest etc. When you use hashtags, you help people who are interested in your topic find your posts and Tweets. HTML stands for Hypertext Markup Language which is a formatting or document description language used to create World Wide Web pages. ‘Hypertext’ refers to the hyperlinks that an HTML page may contain and ‘Markup language’ refers to the way tags are used to define the page layout and elements within the page. Thus it is a system for tagging text files to achieve font, colour, graphic, and hyperlink effects on World Wide Web pages. This includes set of markup symbols or codes inserted in the file that tells the web browser how to display web page’s words and images for the user. The websites created by this can be viewed by anyone who are connected to the Internet. Inbound link is referred to as a link on third-party websites that points to your website. In SEO terminology, it is also known as a Backlink. Inbound links are vital for SEO as Google and other search engines consider such relevant links as a sign that the content on that page is useful. Thus, this determines the Page Rank on Google which influences the position of your website in the search engine. Hence inbound links are very important to reach the majority of internet users as Google accounts for around 80% of the searches performed on the internet. Inbound marketing is an approach that uses content marketing, social media marketing and SEO to attract qualified prospects and build trust and credibility for online business. It provides improved customer experience by offering potential customers information via company sponsored newsletters, blogs and entries on social media platforms. This strategy uses many forms of pull marketing like content marketing, SEO, events and more to create brand awareness. Potential customers can find you through channels like blogs, search engines, and social media. Best example for Inbound marketing is HubSpot. Infographics also called as Information Graphics are a graphical visual representations of information, data or knowledge intended to present data easily and in understandable format. These are widely used as they can quickly communicate messages or simplify the presentation of large amounts of data. Infographics help present complex information quickly & clearly and are seen in public environment like traffic signs, subway maps, weather charts etc. 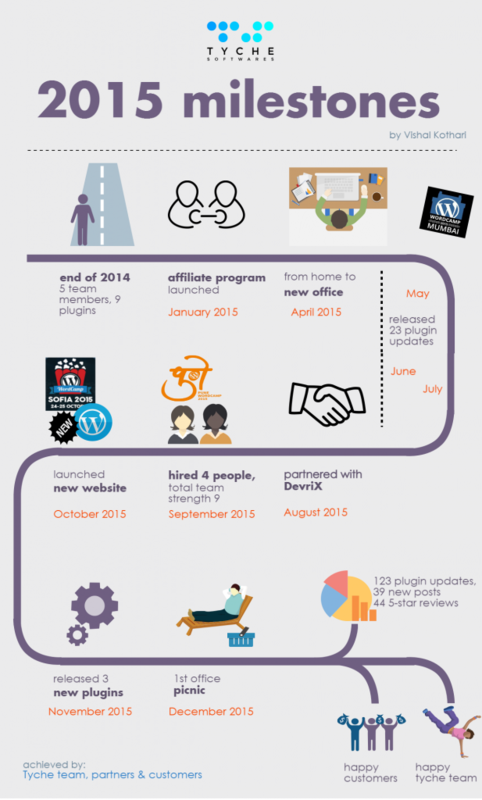 Below is a visual that shows 2015 milestones of Tyche Softwares. Thus this infographic clearly shows how the milestones were met by the company. First, there was the all-knowing store owner who would know everything about the product they sold. Prices, quality, longevity. Now, there is an AI telling the customer what they might like, based on the their purchase patterns. A product recommendation system comes later, as your online store goes large scale, so if that’s where your sights are set, it’s a term you must know. As the tech improves on this, you might want to keep abreast with the possibilities it offers. Instagram is a free online photo sharing and social networking service acquired by Facebook in 2012. It is a social network platform for clicking, editing and sharing photographs and videos with other members through the Instagram website and social media sites such as Twitter, Facebook, Tumblr, Foursquare and Flickr. Instagram app allows members to search for accounts which you want to follow or find photos of friends or any users by following specific hashtags. Instagram is widely used to enhance your original photos to make them look more professional. For example, Instagram’s Valencia filter brightens photos and improves the appearance of drab photos. Inventory is referred to as stock of goods or items in your business. It is the current quantity of products on retailer’s hand which is waiting to be sold. It is vital to keep track of inventory levels in order to make sure the goods which are not in stock are not being promoted on the store. This helps you to keep an eye on shrinkage and minimum order levels. Inventory can be described in 2 ways as goods which are consumed by the company for selling them to the end users or raw materials which are used to manufacture finished goods. Inventory is referred to as current asset on the balance sheet of any company. Inventory is sometimes used as a collateral for obtaining financial help in some cases. Increase in inventory is a signal to the company that its selling point is not effective and anticipated increase in sale in future is not making its desired way. Therefore many companies give ample of time in calculating the optimal level of inventory that should exist at any given point of time. On the other hand, declining inventories signal the company that there is more sales than estimated or the company has a backlog, is probably expecting lower sales or rather the company is experience a blockage in the supply chain. For example, a the function may check a web form before it is submitted in order to make sure that all the required fields in the form were filled. It is a value that helps organizations to evaluate the success of achieving the key business objectives. There are 2 types of KPIs, high-level KPIs that focuss on the overall performance of the enterprise and low-level KPIs that look at processes in departments such as sales, marketing or a call center. It is actually a measurable value that demonstrates the success based on specific business goals and targets. The type of KPI that organizations select depends upon the industry and the part of the business you are looking to track. To find out what types of KPIs are relevant to your department, industry or role, Click Here. Keywords are words or phrases that are used to trigger search results or describe a content. There are 2 ways in which keywords are used on Web: 1) As search terms for search engines and 2) Words that identify the content of the website. 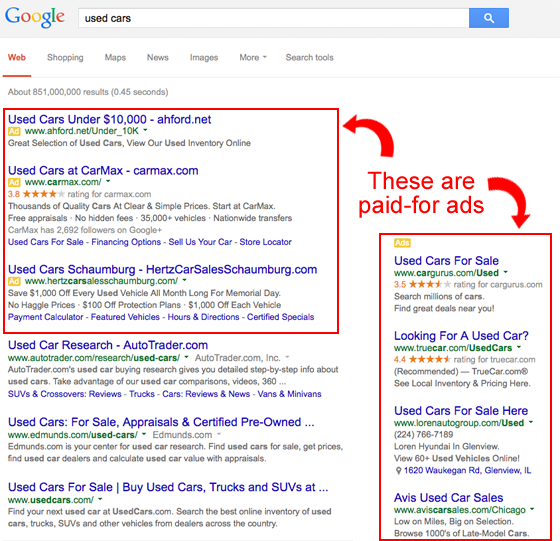 When a specific keyword is searched, the advertiser’s ad that uses that keyword automatically appears on top of the searched pages. One keyword represents a single search query, while keywords that uses two or more words are called keyword phrases. These keywords are used as metadata to describe images, text documents, database records and web pages. For example, a photographer may tag his nature photos with words such as ‘nature’, ‘trees’, ‘flowers’ or ‘landscape’. Thus when he wants to locate the pictures of flowers, he will simply type in the keyword ‘flowers’. Keyword Stuffing is a SEO technique wherein a large number of keywords are loaded onto a web page to artificially increase ranking of the page in search results and drive more traffic to the site. Keyword Stuffing is considered webspam or an unethical practice due to which the website can be banned or penalized temporarily or permanently on major search engines. Now-a-days, search engines are well equipped to deal with this sort of obsolete SEO technique. For example, Google has parameters that can check for keyword stuffing which is hidden away from a casual website viewer. A landing page is the first web page of a website which is advertised on the search engine that visitors arrive at, after clicking the link on the results page. This page contains data or information on the keywords searched and is usually considered as a Deal Page because visitors make up their decision to move on, from the landing page. A landing page is a standalone page which can be reached by the visitor by clicking on the pay-per-click ads, social media links or display banners and have been designed with a specific business purpose in mind. It is also called as a ‘Lead Capture Page’ or ‘Destination page’ that appears in response to clicking on the search result. There should be no global navigation to lead to the primary website from this page in order to guide your visitors toward your intended conversion goal. It is referred to as an amount of money that online auction or trading sites charge for listing their products online. This listing fee put up by such sites depends on the value of the items to be sold as well as the starting price of these items. Listing fee is also called as Insertion fee and are non refundable. The listing fee can amount to an increase if you wish to take advantage of priority listing. It is a marketing classification used to describe a prospective consumer or organization who expresses interest in a business’s product or service. Businesses gain access to sales leads through advertising, trade shows, direct mailings and other marketing efforts. You can also purchase leads from third-party companies. It is actually a label applied to a prospect that has passed the engagement stage and is ready to be pursued for conversion into a customer. At this stage they have already provided their contact information and have shown interest in making a transaction. This is the process of steadily communicating and developing relationships with qualified sales leads who have not yet made the decision to buy. In this process, leads are sent newsletters, content and promotional materials that keeps them engaged in an attempt to head them towards sales. Email marketing is one common form of lead nurture where the aim is to provide prospects with information and answers they need during their buying journey. According to Hubspot, less than 10% of inbound leads can make to an immediate purchase whereas 90% these are left behind. To know more on effective tactics of lead nurturing, Click Here. LinkedIn is the largest professional networking and employment-oriented social networking site launched on May 5, 2003. It allows you to share work-related information with registered members and get connected to other professionals. Like Facebook and MySpace, LinkedIn also allows you to create a custom profile which is business-oriented rather than personal in nature. Network members are referred to as ‘Connections‘ and membership on LinkedIn can be derived for free. LinkedIn is highly recommended for exchanging knowledge, ideas and employment opportunities that helps individuals to expand their networks as well as find jobs in their own field. The Lifestyle stages include firstly market analysis and product development, after that release of product with high level advertising, then the eventual sales rise, thus reaching the upper bounds of demand cycle and gradually declining due to introduction of newer products. Logistics means management of goods & services or resources between the point of origin and the point of consumption to meet the requirements of customers or corporations. This is a part of supply chain management where resources like physical items such as food, materials, animals, equipment and liquids as well as abstract items such as time and information are managed. The process involves planning, implementing and controlling the effective and efficient forward and reverse flow and storage of goods and services or related information. It is a retail marketing term used to describe the practice where large volumes of products are sold to smaller amounts of people in contrast to selling handful of products to many people. It is actually a transition from hit-focussed marketplace to millions of niche marketplace. This business phrase was first coined by Chris Anderson in 2004 where he described this as niche marketing in it’s purest form. The idea is to attract significant amount of traffic by adding up the volume of products. Best example for this practice is Amazon where millions of products are provided with only a handful of visitors every month but with a vision to gradually add up into substantial traffic flows and sales. Long-Tail Keyword is a type of keyword phrase that is more specific and usually longer than more commonly searched keywords. These keywords consists of either three or some times five words in the phrase and are mostly used to target niche demographics than mass audiences. Long tail keywords get less search traffic but will usually have a higher conversion value. These are more specific but often less competitive than generic keywords. Marketing is referred to as activities of a company that includes advertising, selling and delivering products to customers. Marketing is one of the premier components of Business Management where the companies look to target audiences by using slogans, endorsements or media exposure. It is actually a way to create, retain and satisfy the customer by communicating with them, delivering their requirements and exchanging offerings that have value for them. This is achieved by implementing strategy that involves sales techniques, business communication and development. Marketing automation refers to the use of software to automate the marketing processes for effective marketing of goods and services on different online channels and automating repetitive tasks. Marketing automation is an integral component of Customer Relationship Management (CRM) where processes like customer segmentation, customer data integration, and campaign management can be carried out efficiently. This technology allows organizations to streamline and automate the marketing tasks and workflows and manage them. This helps them to increase operational efficiency and achieve the ultimate goal of growing the business revenue faster. mCommerce also called as mobile commerce refers to the use of wireless handheld devices for buying and selling of goods and services online. 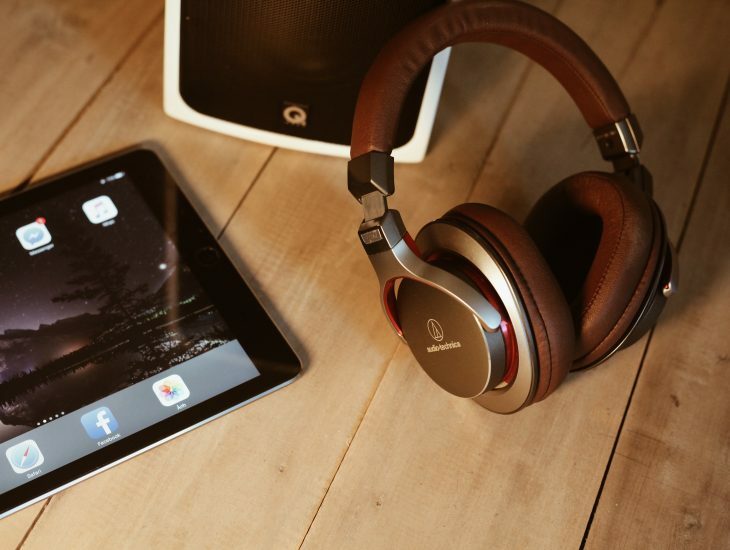 These wireless electronic devices are mobile phones, smart phones, tablets or personal digital assistants (PDAs). Mobile commerce was originally coined by Kevin Duffey at the launch of the Global Mobile Commerce Forum in 1997, where he mentioned about delivery of eCommerce capabilities in the consumer’s hand via wireless technology. A Merchant Account is a type of business bank account that allows businesses to accept and process payments through debit or credit cards. Therefore a merchant account is an agreement between a retailer, the merchant bank and payment processor to settle transactions via debit or credit cards. Merchant accounts are a must for online businesses which means if you want to operate an eCommerce business that allows card payments, then you need at least one internet merchant account to serve the purpose. Here firstly the money of the purchased goods get deposited in the merchant account and then eventually gets transferred to the business bank account. This transfer usually occurs on daily or weekly basis. Microsite is referred to as a web page or a small cluster of pages that acts as a supplement to the primary website. It is a specific content site which is designed to live outside of the company parent website and has a separate URL than its homepage. Microsite is also called as a Minisite and are used for branding or promotion purpose. For example, some companies use them to highlight a specific campaign or target specific buyer personas while others use them to narrate a short story or to inspire a specific call-to-action. Such sites usually comprises of Tweet and Follow Us buttons that work as call-to-action with no navigation bar or any links to go to other websites. Microsites have less complicated design and have specific targeted information that serves the purpose. This is also called as Sales Funnel or a Buying Funnel. The Mid-Funnel tactics include Email Marketing, Marketing Automation, Webinars etc. Mobile Marketing also called as Wireless Marketing is a form of marketing which uses modern mobile technology to promote personalized goods or services to a user via mobile devices like smart phones, tablets or PDAs. The features of this mobile technology provides time and location sensitive information to customers and information which is personalized in nature. It is a multi-channel online marketing technique focused at reaching a specific audience on their smart phones or tablets through websites, emails, SMS, social media or mobile applications. It is a practice of ensuring that your visitors who are accessing the website through mobile devices have a brilliant user experience, both practically and visually. This is achieved by optimizing the website content in such a manner that the visitors can accomplish what they want to do on their mobile devices. Mobile optimization involves reformatting the website by keeping larger navigation buttons, only having purpose rich content and optimized images that fits well on any handheld devices. This helps larger mobile audiences to remain engaged while making the key buying decision. This is referred to as a Predictable Revenue! A revenue/income that any business is liable to receive every month consistently, is termed as MRR – Monthly Recurring Revenue. This acts as a by-product of a subscription business which implies billing takes place on monthly basis. The simple way to calculate your MRR is to multiply your total number of paying users by the Average Revenue Per User (ARPU). Native Advertising is a type of online advertising where online content is created for paid promotion of a brand on media site but resembles the publication’s editorial content. There is no use of traditional ad formats like banner ads etc but includes editorial content like blogs or infographics. 2) Driving consumers to take one particular action. Net Promoter Score (NPS) is a metric that measures the willingness of customers to recommend company’s products or services to others. This determines customer loyalty for a company’s brand, products or services. This metric was developed by management consultant Fred Reichheld of Bain & Company in collaboration with the company Satmetrix in 2003 with an intention to determine the customer satisfaction score. Net Protector Score depends upon the perspective of company’s customer base which could be either promoters, passives and detractors. A simple question: ‘Would you like to share your experience of transacting with the company with your friends or colleagues? can help gauge the willingness of your customer base in promoting your company’s product or services. News Feed also called as Web Feed is a service by which users are provided with frequent transmission of data consisting of news updates. These are received by subscribers in XML format as summaries or links of updates about those people who are in your friend’s list as well as the odd advertisement. On the Facebook social networking site, a News Feed is a list of updates on your own Facebook home page. There are different news feed formats like RSS and its different versions as well as ATOM. No-Follow link attribute is an element that instructs the search engines bots not to follow the link. This means its a notification to search engines saying ‘Do not count this link’ so that they will not crawl the link and pass any link juice to it. When No-Follow link is used there is no boost in the Page Rank and does not help page’s placement in the SERPs. On-Page Optimization refers to all the measures taken within the website in order to improve the web page listing or position in search rankings. It is one of the very first step of SEO that can help you increase your overall CTR (Click-Through-Rate) ratio. On-Page Optimization includes optimizing the web content, improving the meta description and title tags as well as HTML code and keyword placement. This not only helps getting good page ranking on search engines but also increases overall readability of the site. 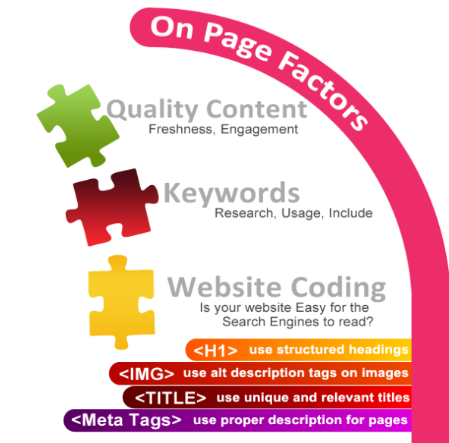 There 5 key elements of a successful On-Page Optimization is displayed in the image below. Off-Page Optimization refers to all the measures taken external to the actual website in order to improve its position in search rankings. Off-Page Optimization is a long-term process and includes acquiring many high-quality backlinks (incoming links) to your page from the authority sites. This usually does the background work for better search results and builds your online reputation. This technique involves not only getting back-links from other sites but also includes other practices like social networking, social bookmarking, blogs, videos etc. While some basics of marketing strategies have not changed as we move to a digital world, one aspect definitely has. It’s the presence of your store across platforms, which may or may not have the same customers. Omni-channel management means giving the user a seamless shopping experience. You know the thing Amazon does, where your wishlist or cart from one device appears in another? That’s omni-channel, your next step in eCommerce marketing and targeting. It involves ensuring that whether the customer comes to your store offline or online, via a mobile app or the website, the shopping experience should remain the same. How to ensure that? Well, that’s what you must go figure. The Open Rate is a percentage representation of the number of people on the email list that opened a particular email campaign. This percentage is calculated by dividing the number of email messages opened by the total number of email messages sent. This means if open rate is calculated as 20% then it means out of 100 emails sent to recipients, 20 were opened (or viewed). According to Mailchimp benchmark reports email open rates average between 15% & 30% across most industries. It is a process that every organization undergoes for delivering goods to end users. Order fulfillment refers to the steps involved in this process from the point of sale until delivery of the order. Steps involved in this process are: Receiving, Inventory Storage, Order Processing, Shipping and Returns Processing. Example – Consider any fast food joint that receives an order for delivering food items to the customer’s doorsteps. The order fulfillment process starts at the point the fast food joint received a call from the customer for placing an order. Then the joint processes this request which means prepares the food items to be delivered. It is then packed and put into a bag, given to the delivery boy to get it sent to the customer. When the order is delivered and transaction is completed, that marks the end of the order fulfillment process. Pageviews is a part of web analytics and is also called as Page Impression. Whenever the visitor visits a page on the website, it is referred to as a Pageview. This is tracked by website monitoring applications to help website owners to decide on a strategy to result in more web traffic. This is also helpful for publishers to understand how well their ads are performing and calculate the expected revenue from it. This is a software that facilitates payment transaction by transferring information to Acquiring Banks and transmits responses from Issuing Banks like transaction approved or declined. It is a merchant service that allows a merchant to accept credit card and other forms of electronic payments. Payment gateways help to protect sensitive information by encrypting the data they transmit to merchants and payment processors. When referring to payment gateways used for Internet transactions, it may also be called an IP payment gateway. Popular payment gateways include PayPal/Braintree, Stripe, and Square. Profit margins are expressed as a percentage of selling price turned into profit. It is used to measure how well the company can control its cost. The higher the profit margin is, the better the company is thought to control costs. Investors use profit margin to compare companies in the same industry or between industries to determine which are the most profitable ones. Example – The below image shows information of XYZ company. Partial Shipment is also called as Part Shipment which is a special kind of distribution process where the delivery of a shipment takes place in more than one consignment. In this shipment, the permission must be given by the customer for delivery of a part of total quantity of an order. Only then the partial shipment is considered acceptable, upon which various codes are given to the customer for order tracking. PPC is also termed as CPC which means Cost Per Click. It is a form of advertising when the advertiser pays only when his ad is clicked and his prospect is successfully directed to his website. It is an online advertising model where you bid on specific keywords and pay every-time someone clicks on the advert and gets directed to your website. Google’s AdWords platform is the best example of Pay-Per-Click promotion. It is a third party that partners with Acquiring Banks to offer Merchants the capability to accept and facilitate payments, also known as PSP. It is an online service for accepting electronic payments by using various payment methods like credit card, direct debit, bank transfer, and real-time bank transfer based on online banking. It is also called as Point of Purchase (POP) and refers to as a place where sales are carried out. It is a point at which a customer makes a payment to the merchant in exchange for goods or after provision of a service. A Point-Of-Sale (POS) terminal is a computerized replacement for a cash register that has the ability to record and track customer orders, process credit and debit cards, connect to other systems in a network and manage inventory. This is referred to as a prospect that has expressed interest in buying your product and passes a set of lead qualifications in order to progress towards becoming a customer. This is a part of lead tracking system where the visitor has demonstrated interest in the website’s content to become a Qualified Lead. Virtually placed items in a shopping cart. Each type of the above interaction helps to determine where the visitor is in the buying cycle or not. QR Code is a short for Quick Response Code which is a machine-readable two-dimensional barcode consisting of an array of black and white squares. It is typically used for storing URLs and to provide easy access to information through a smartphone. These are more useful than any standard barcodes because they can store and digitally present data including url links, geo coordinates, text etc and can be easily scanned by modern cell phones. It is a transaction in which the customer has given permission to the merchant to charge for goods/services on a prearranged schedule. You give your card details to the company and authorize them to make series of payments without having to give consent again and again. Recurring transaction takes effect for goods or services where purchases are repeatedly and regularly made, often on monthly basis. For instance, paying cable bills, cell phone bills, gym membership fees, utility bills and magazine subscriptions. Responsive Design is a design philosophy that provides a customized viewing experience for different browser platforms. Web pages which are responsive in nature will detect the visitor’s screen size and orientation and change the layout accordingly. The primary reason to keep your design responsive is to increase the reach of your application to a larger audience using an array of devices. Example – A responsive website would appear differently on laptops, tablets, or smartphones in order to provide increased usability and complete satisfaction to users. ROI measures the gain or loss generated on an investment relative to the investment’s cost. It is usually expressed as a percentage and is used for personal financial decisions to compare a company’s profitability or to compare the efficiency of different investments. 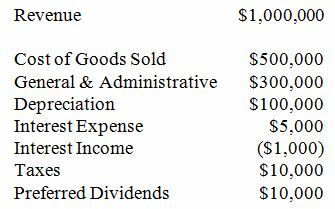 ROI is also called as Rate Of Return or Yield. It helps investors to determine how efficiently each dollar invested in a project is at producing a profit. Example – If the long-term ROI of a company is lower than its cost-of-capital, then the company is better off by liquidating its assets and depositing the proceeds in a bank. SEO is a marketing discipline that focuses on getting traffic from organic search results on search engines. This works at improving the visibility of a website or a web page in search engine’s unpaid results. SEO comprises of various technical and creative elements which helps in optimizing search rankings, drive traffic and increase awareness in search engines. These includes different types of searches like image search, local search, video search, academic search etc. To find the top 10 companies providing best SEO solutions, Click Here. Each listing would have a linked web page title, URL of the linked page, a brief description of the page content and sometimes links to the key components of the website. It is an official contract signed between the service provider and the customer that documents the services expected from the provider and defines the performance standards that is required to be met. This official commitment includes the nature, quality and scope of the service, availability and responsibilities to be provided, which are agreed between the service provider and the service user. Apart from listing expectations, it also provides remedies when the requirements are not met by the provider. E-businesses are moving towards cloud computing, While it allows for businesses to go online or cheap, it also raises questions; of privacy, data security and more. In such a case, a Service Level Agreement becomes twice as important. Take time to understand the ramifications what it means for you, your business and your customer. Everything is a click away. Not the SLA. To get an idea of a sample SLA document, Click Here. Smarketing is a process in which sales and marketing teams are aligned to have a common integrated approach towards achieving the business goal. This kind of integration between the two teams is created through frequent and direct communication between the two. For instance, marketing team might have mutually agreed upon SLA to hit and sales team must agree to follow an approach to fulfill those. Hence, Smarketing goals should be made together and re-evaluated on monthly basis to determine opportunities for improvement in both teams. To know more on Smarketing, Click Here. Social media is referred to as a collection of all online communication channels dedicated to forums, microblogging, social networking, social bookmarking etc that facilitates the creation and sharing of information, ideas and other forms of expression. Social media involves blogging, discussion forums and other forms of interactive appearance that allows individuals to engage in conversations over a particular blog post, news article or event. It is a psychological phenomenon in which positive influence is created where people assume the actions and attitudes of people have the correct behavior for a given situation. Social proof can be built in the form of testimonials, reviews or trust seals which in a great way generate interest, increase credibility and drive more conversions. To know in detail about them, Click Here. 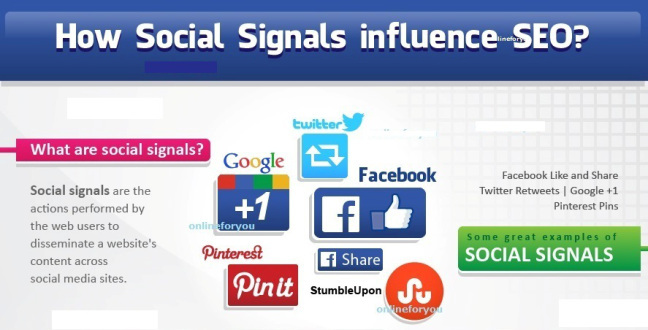 Social signals are communicative signals of social media activity like shares, votes, pins or likes on social media sites which are taken into consideration by search engines for ranking algorithms. Social signals directly or indirectly provide information through social interactions, emotions, behavior and social relationships on social media sites like Facebook, Twitter, LinkedIn, Pinterest or Tumblr. An easy way to apply social signals to websites or blogs is by using social share buttons. Software as a service (SaaS) is a software distribution model that provides access to software and its functions remotely as a Web-based service. It is licensed on a subscription basis and is centrally hosted, thus removes the need for organizations to handle installation and maintenance. SaaS applications are also called as Web-based software, On-demand software or Hosted software. It is one of the three main categories of cloud computing, alongside infrastructure as a service (IaaS) and platform as a service (Paa). An interval of time between two related events is called Time Lag. In eCommerce terminology, it is the number of days in between the visits before a multi-channel conversion is completed by the visitor. Thus it determines the time between the first interaction date and conversion date within a look back window (a specified time span prior to conversion). Example – Consider a look back window set to 30 days and Google Analytics is searching for all the interactions of the user within this period. If the result shows that the user interacted with the content 31 days before conversion took place and returned in 31 days to complete the transaction, then the time lag will be equal to 0. This means the interaction of the user when he completed the purchase, was the first one. This refers to a software or a packaged product which is built, installed and supplied by the manufacturer in its completed form, ready to operate. This is contrasted with build to order products where buyer’s exact specifications are taken into account and are made as per their expectations. A Turnkey project is a qualified product that has ready to go backend (the admin site) which allows important changes and updates like products, pictures, text, categories, subcategories etc to appear on the front end which is the main site. This kind of solution is most widely used for training programs or billing system where the purpose is to avoid the hassle of setting up your own in-house solution. Third Party Payment Processor is a company that handles merchant account payments from various channels such as credit or debit cards for merchant acquiring banks. These processors often use their commercial bank accounts to conduct payment processing for their merchant clients. Best example for this is PayPal that lets you accept online payments without a merchant account of your own. They let you use their merchant account under their own terms of service with very little setup required. This marks the very first stage of the buying process. Top of the Funnel is referred to as any touch-point that begins an interaction of a customer with the company. The marketing tactics at this stage includes activities like content marketing and campaigns that target wide pool of potential customers. This is done by engaging prospects with thought leadership where buyer’s interests and needs are fulfilled. Content is published on blogs, websites, social media, online ads, videos etc which are more customer centric, visual and appealing. Example – The below image is a good example of a smart content marketing tactic to draw more prospects into the buying process. 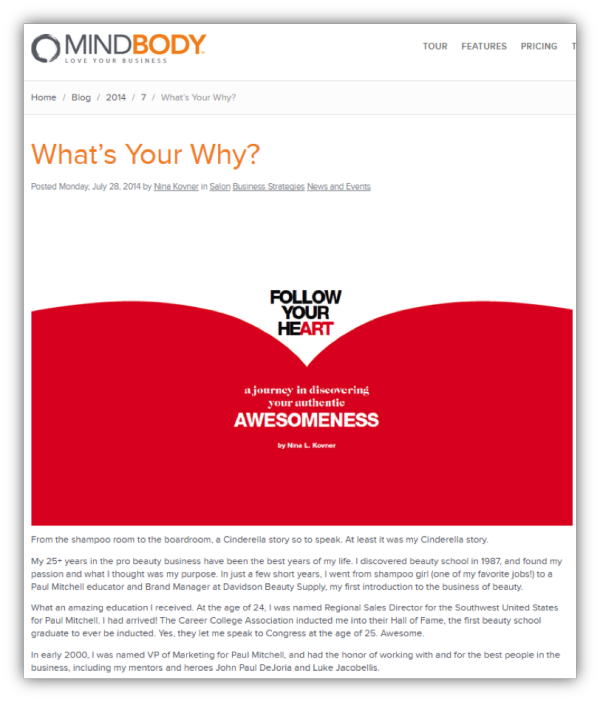 The above content undertakes an emotional approach for targeting small business owners in health, fitness, spa and beauty industries. It talks about how passionate one would be about his dream and leading towards that path by describing their own journey. Thus making the content engaging and customer-specific. In web marketing, a unique user is an individual that has visited a website for a given period of time or have received specific content like ads, emails or newsletters. Marketers and website owners track unique users to determine how many people see their content within a given period of time. Unique user is counted as a single visitor irrespective of the number of times he or she revisits the site. This is determined by user identification or unique IP addresses or via a cookie that attaches to the user’s browser. Analytical programs are used to identify and filter out visits that are not human, such as visits from spiders, crawlers and other bots. It is a sales technique that persuades a customer for buying something additional or expensive while making a purchase. This business strategy makes the customer get exposed to other options that he perhaps had not considered, with an attempt to make a more profitable sale. Upselling includes selling better features or specifications of the selected product, an upgrade or more expensive version of what they are buying or any add-ons. Examples – Typical examples of upselling would include buying a burger at a fast-food joint where you are asked if you would like to add some fries and drink to the order at a minimal amount. It also happens while buying electronic gadgets where they upsell for warranties and also at the gas station where you are asked to purchase a car wash after filling in the gas at the gas station. This refers to visitor’s overall experience about using a particular product, system or service especially in terms of how easy or pleasing it is to use it. It highlights the experiential and valuable aspects of human–computer interaction (HCI) and product ownership. True user experience means providing customers with not only what they want but goes far beyond giving them more than that. High-quality user experience can be achieved by having seamless merging of services of multiple disciplines including engineering, marketing, graphical and interface design. If you get answers to all the below questions then it means you have succeeded in achieving your goal of ultimate user experience. Useful – Is this useful? Findable – Can you locate it easily? 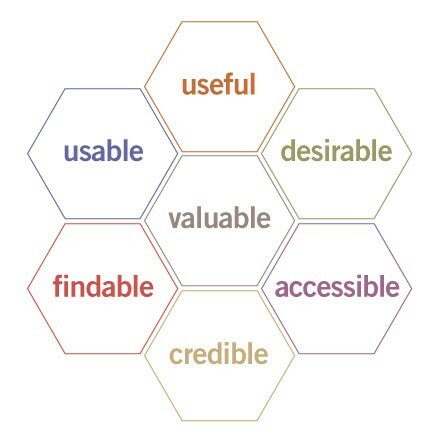 Usable – Is your purpose served? Desirable – Do you wish to use it? Valuable – Is it valuable? Credible – Is it trustworthy? Accessible – Can you access it easily? A user interface is considered good if it provides a ‘user-friendly’ experience by allowing users to interact with the software or hardware in a natural and intuitive way. A powerful program with a poorly designed user interface has very little value. User interface determines how commands are given to the computer and how information is displayed on the screen. 2) Menus where users can select commands from lists displayed on the screen. The content which is specific to business areas that has become viral is termed as ‘Biral‘ (Yes, that’s Biral & not Viral) by Jacob Morgan. This content should have an engaging factor with relevant information on products and brands. It should seek interest of the customers wanting them to spread the word about the company or business. Web analytics is a set of strategic methodologies that study the impact of a website on its users. In general term, it is a tool for web business owners and market researchers to assess and improve the effectiveness of a website and gauge traffic & popularity trends. Web analytics software is used to measure details like number of visits, unique visitors’ count, their entry points, specific keywords used, their online session time, what did they search for and when & why did they leave the site. It is also called as Digital Analytics and plays a key role in digital marketing and website optimization. Sitemap is a textually represented hierarchical model of website’s content pages. The list is provided with links to its counterpart sections of the website and are organized by topic in an XML format, thus the term – XML Sitemap. XML document provides instructions to search engine crawl bots to search and display content/information users have requested for. Example – The layout maps in huge shopping malls perform the same function as that of a sitemap for the website. But websites which are small in nature are usually uncomplicated and a sitemap there would not be required, like you would not want to refer a layout map for smaller shopping malls where it is easy to locate our way.